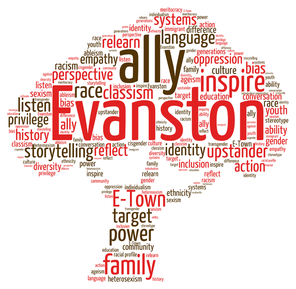 The Evanston/Skokie PTA Council presents Becoming Allies: Inspiring Our Kids to Understand and Stand With Each Other. The series explores the meaning of "allyship" and how to become better allies through listening and supporting one another across differences. Childcare and Spanish translation provided. ​The first program in the series, Seeing Each Other in the Stories We Tell, welcomed four professional and parent storytellers who shared personal journeys navigating issues of identity and social justice. A discussion followed, facilitated by Rahul Sharma, that deepened our understanding of each other and empowered us to become stronger, more effective, allies. The story night went very well. I am happy with how I did. It was my first time speaking in front of a group of people and it was a terrific group, so I felt comfortable. As I got up to speak, I remarked that I was surprised that I felt so comfortable, given that it was my first time, but that I would feel more comfortable if there was laundry on a bunch of the seats and there were dirty dishes strewn around. This got a few laughs, which helped. There were three other story tellers and they were extraordinary. The first was so wonderful that even though I was to go next, I wasn't thinking about my turn. That was a huge help. I will post links to the other story tellers next week. (I'm participating in a fb blackout starting tomorrow - more about that later.) For those that asked, I would like to record my story and the others from last night (if they agree) and I will let you know when that happens. Here's what I said last night. I must say, I think I did a good job saying the story out loud and that it doesn't come across in the written form, because I really wrote it for speaking in front of an audience. I'm copying it from my pages, with the capitalized words that I used last night to keep me on point. Thanks for asking (for those of you that did ask smile emoticon I appreciate your love and support. and big thanks for Yancey, Quinn and Belaye, who have taught me so much. One night, back when I was in my early 20’s, I was in a café with my friend Linda, drinking wine and lamenting the state of my love life, when I said to her, the next good looking man I see, I’m asking out. If he ends up being a jerk, at least I'll have something NICE to look at.” A short while later, a GORGEOUS Black man walked into the cafe to start his bartending shift. And that was it. That was how I met the man I have shared my life with for the last 27 years. A white friend of ours at the time, told me that I was ‘brave’ for dating a Black man. But I wasn’t brave. I was clueless……. because up until Yancey and I began dating ….. I never thought about race much at all. The GLEN ELLYNS! Those ARE my people. Glen Ellyn Illinois, when I grew up there in the 1970’s was White…Protestant …and middle class. Dads went to work, moms stayed home and no one talked about anything controversial without whispering. My mother however, is from Boston. She was and still is an outsider in Glen Ellyn. I mention this because it is important to note that her outsider status allowed her to speak up more freely. My mother…put DOWN her tea cup, stood UP and announced that she did NOT allow that kind of hateful talk around her CHILDREN. And we left. I might not have remembered that conversation, if my mother had POLITELY CHANGED THE SUBJECT and the lesson, WOULD HAVE BEEN that Hate speech, was ACCEPTABLE. But instead, the lesson I learned that day, when my mother STOOD UP and ended the conversation, was that Hate IS INTOLERABLE and standing up for PEACE AND LOVE is more important than being polite. Her courage helped shape my life. I believe in that moment and others like it, she was forging a path that led me to the family I have today. In spite of my parent’s strong held beliefs race was rarely discussed during my childhood and because of that, I was left with the impression, that it was no longer a major issue for our country. When I left home at 18, I believed that Dr. King’s dream had been realized. When Yancey and I started dating, I began to experience a different America from the one I knew. In this, new to me, America, Yancey could be thrown out of a museum for taking photographs, even though, photographs were PERMISSIBLE in the museum. Even though, we had asked if photographs were allowed and were told, YES, they were. In this America, The guard who threw him out, did so, knowing that my grandmother and I, were sitting on a bench inside the museum, waiting for Yancey, believing that he was still walking through the galleries. In this America, Yancey could do nothing, but stand outside of the museum, waiting for us to come looking for him. In this America I could walk into a café in a beautiful neighborhood of Boston and ask for the restroom key and be given it, but Yancey, walking in a few minutes before me, would be told, that the key had been lost for a while, the locksmith wouldn’t be coming that day, and perhaps, he could use the restroom in the store down the block. This was the America, where Yancey and I would be on our way to a formal event, that he was hired to photograph, when a cop would pull us over, because Yancey had failed to use his turn signal, when he made a right hand turn, at a 4 way stop, with no one else on the road . In this America the first question the officer would ask, was “Whose car is this?”, and even after Yancey gave the officer his driver’s license and registration, he would accuse Yancey of stealing his own car. In this new to me, America, we would be brought down to the station and 3 more police officers would claim to have run the plate number and insist that the car was listed as stolen. In This America, we would sit on a bench in the station in our beautiful clothes, until long after the start of the gala. Before dating Yancey, I believed I had never witnessed racism. Now, I know that being white, I was unable to some of the things that were happening around me. There was no sign on the bathroom door of the café that read ‘whites only’, yet, segregation was still happening, only most of the white patrons of the café that day didn’t know it. It is likely, that some of the most racist things that have happened to people in this country have happened RIGHT IN FRONT OF YOUR FACE, you just didn’t realize it. My children’s schools have great diversity and it’s a blessing, but the experience is very different for children of color than it is for white children. For my children, it is as if, when they enter kindergarten, a cart is strapped to their back, and throughout their years, it is filled up with the heaviness of racist remarks and microagressions. The weight of these experiences do not go away with time. 27 years after my friend told me that Yancey wasn’t really black, Quinn is being told the same thing by his classmates. Quinn has spent many summers visiting my inlaws, Levonia and Andrew Hughes. The Hugheses moved during the great migration from Columbia Mississippi to Detroit. Just like their grandson,Belaye bringing Ethiopia with him to New York, they brought Mississippi to detroit. When we visited, Quinn ate his grandmother’s home smoked salmon and her greens. He banged on the piano in the living room and he helped his grandfather Andrew, water his rose garden which contained hundreds of varities of roses. Andrew Hughes, worked 2 jobs his entire adult life, so that his wife would have a beautiful home, his children could go to college and when they were adults, he would be able to purchase a home for each of them. Of all the insults and slights, that are piled into my children’s imaginary carts, the worst is the idea that success means they are less than black or that they are somehow leaving the black community in order to succeed. Nothing could be further from the truth. My children are primed for success, because they have come from a line of people who were wise, hard working and had faith. I believe their ancestors imagined that through their unwillingness to fail, they were paving a way for my children to have the lives they do today. If civil rights have not been fully realized as we know they have not, I believe it is because too many of us leave the action and the discussion outside of our homes. We need to open the front door and invite the cause of peace and antiracism to the table. White families need to be talking about race as often as we talk about manners and grades and sports. Children will not believe something fully until they hear their parents say it. At dinner and in the van on the way to the soccer, we need to be talking about race. We need our children to understand that when Black children do something really well, it is because they have worked very hard AND it is because they have inherited greatness and they are fullfilling their destiny. Greatness is not a borrowed commodity. I would like to leave you with the first line of my favorite quote, I have had this quote in one journal after the other for the past 30 years. I refer to it often when I feel I don’t have the strength, to do what I need to do. It is the french philosopher Gaston Brachelard. Emily Lansana is a professional storyteller based in Chicago, incorporating folklore, history, ethnography, and community traditions to deliver positive and uplifting messages. She will be performing with In the Spirit at the Evanston Public Library’s First Annual Storytelling Festival on October 9-11. She is the Associate Director of Community Arts Engagement at the Logan Center for the Arts of the University of Chicago and a teacher on the art of oral storytelling at the Logan Center. You may have seen the exhibition of Evanston artist Jevoid Simmons this past February at the Noyes Cultural Arts Center. His exhibit of wood carvings entitled "A Family's Journey Home: Narrative and Visual Expressions" depicted his family’s flight from Alabama to the Midwest in 1952 during the Great Migration, the mass movement of African-Americans out of the South from the 1920s through the 1970s. Kristine Nesslar is a white writer and activist residing in Evanston with her black husband and two black sons, both of whom attend District 65 schools. When her oldest was two years old and started to talk about skin color and, eventually, race, Kristine realized she and her son were sharing the same home, but not the same world. She was one of the organizers for Maria Hamilton's Million Moms March held on May 9, in Washington, D.C., to show support for the families of those killed by police brutality and racial injustice. Danny M. Cohen is a professor at Northwestern University's School of Education and Social Policy and The Crown Family Center for Jewish and Israel Studies. He is also an author of human rights fiction for young adults, so many of you with 7th-8th graders may be familiar with his historical fiction book set in Berlin during the Holocaust entitled Train, which just came out this year. Danny is the founder of the educational nonprofit Unsilence Project. His teaching and research also focuses on the experiences of transgender, lesbian, gay, and bisexual people. The facilitator of the session is Rahul Sharma, Psy.D. He works on gender issues, race relations,multicultural issues and the prevention of violence against women. Dr. Sharma is currently Associate Professor at the Illinois School of Professional Psychology at Argosy University, Chicago and Chair of its Diversity Concentration. In addition, he is founder and bassist/sitarist for the intercultural award-winning music group Funkadesi, a Chicago-based group that blends Indian music with reggae, funk, and Afro-Caribbean grooves. He is also a District 65 parent. ​Click here for more information from the City of Evanston press release.